The luxurious Bahia del Duque resort is perfectly situated on the beach and our stunning selection of stylish properties provide a comfortable and contemporary place to relax. The wonderful Bahia del Duque resort offers luxurious surroundings in which to enjoy the best of the Tenerife sunshine. Our stunning selection of stylish properties in the resort provide a comfortable and contemporary place to relax, and offer the perfect base for enjoying all the resort has to offer. Situated right behind the beach of El Duque, the wonderful Bahia del Duque resort offers a fantastic blend of fun-filled activities and a beautiful setting. Enjoy a game of tennis or visit one of the golf courses nearby, relax in the spa or savour a delicious meal in one of the 8 different restaurants. Great entertainment can also be enjoyed in the resort hotel. Whatever you want from your holiday, there’s something to suit a variety of tastes at Bahia del Duque. Get a taste of life the local way, find events taking place in your Holiday Resort and beyond. If you wish to enjoy a few games of tennis whilst on holiday, you will find two tennis courts at Bahia del Duque (as well as two paddle courts). There is also an excellent tennis school available offering professional tuition and tailored training programmes for all ages. 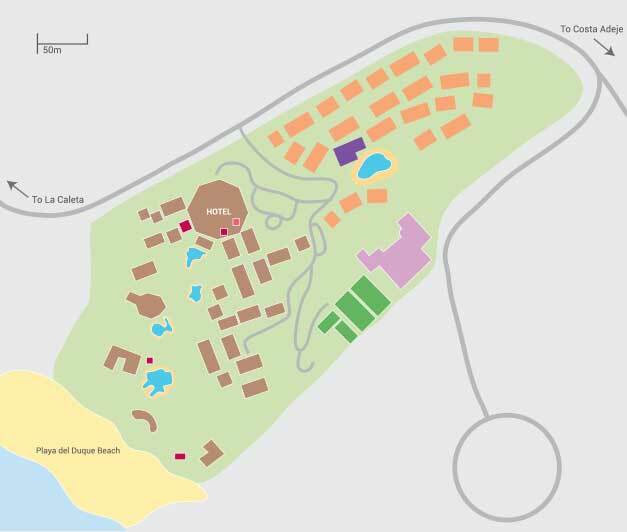 Bahia del Duque resort offers a fully-equipped gym. Here you can enjoy a work out using the variety of cardiovascular and weights equipment. The gym also offers a variety of fitness classes available to guests, including dance classes, aerobics, Tai-Chi and an aqua gym. A fantastic kids club and teen lounge are available at Bahia del Duque, offering a variety of fun-filled activities for kids of different ages. Activities and events on offer include painting, crafts, treasure hunts, a mini disco and much more. Open all year round between 10am and 6pm. The spa at Bahia del Duque is carved into a natural rock face, creating a ‘natural oasis’ in which you can totally relax. Facilities include palm shaded relaxation areas, private terraces, open air treatment cabanas, pools, fragrant gardens, steam rooms, saunas, treatment suites, and cool relaxation areas – all designed to create the perfect environment to help you unwind. Why not treat yourself to one of the many wonderful ESPA signature rituals and treatments on offer? Within the resort complex you can enjoy a dip in one of the five fantastic communal swimming pools, including two heated, one fresh water pool, one salt water pool and one children’s pool. Additionally, there is a shared pool thats exclusive to the villas. Pool is open from 10am to 6pm daily. Guests at Bahia del Duque have the choice of 8 fantastic themed restaurants, offering a superb variety of cuisine. This means that a wide variety of tastes are catered for. The resort also offers 10 bars to choose from. Situated in a unique and exclusive setting, Las Aguas is open daily for dinner service and offers a a taste of authentic Canarian cuisine with a modern twist. This fantastic restaurant is exclusively for adults and formal attire is requested. Featuring nightly cuisine themes, El Bernegal is the main resort restaurant offering buffet breakfast and dinner service. From the large terrace you can enjoy stunning views of La Gomera. Located in the central plaza, La Brasserie offers the most representative dishes of French cuisine and is open daily for dinner service. Occupying views over the central plaza, where the nightly shows are held, La Trattoria offers a wide variety of traditional dishes and a superb selection of fresh pizzas and pastas. The restaurant is open daily for dinner service. The beach club is open during the day for lunch and is where you can enjoy seafood, rice, fish and all the best of the Mediterranean cuisine. The restaurant is located next to the main swimming pool and features views over the ocean and of La Gomera. Offering the classic dishes of traditional Spanish cuisine, this intimate and rustic corner boasts dishes such as tapas, paellas, fresh fish and stone grilled meat. Situated on the beach promenade, La Hacienda offers varied cusine of three continents with a Latin atmosphere. The restaurant is open to the public daily for lunch and dinner services. Asia-Kan is an extrodinary restaurant offering a fusion of Japanese, Chinese and Thai cuisines. Located next to the swimming pool, the Brasserie Snack Bar is open daily for lunch and offers a varied menu of salads, sandwiches, pasta, meat, fish of the day, dessert and cakes. The Lobby Bar is situated opposite the main resort reception and is open daily from 10am to 11pm. The Piano bar is the ideal place to enjoy live music and shows. Open daily from 7pm to 1am and is located next to the main resort reception. La Zumeria offers natural fruit juices, situated next to the salt water pool and is open daily between 11am and 6pm. Suspended over the main swimming pool, Bar Beach Club is the ideal place to relax with a glass of champagne and is open daily from 11am to 6pm. Situated on El Duque beach, El Chiringuito offers a range of drinks and light snacks and is open to the public daily from 9am to 6pm. Boasting fantastic views of the ocean, Cafe La Bahia offers a menu of sandwiches, pizzas, fish, meat and salads. Open to the public daily between 10am and 6pm. With a Latin atmosphere and Caribbean-inspired cocktails, Terraza La Gomera is situated on the beach promenade next to the restaurant La Hacienda. Open to the public daily between 11:30am and 11:30pm. Offering traditional handmade ice-creams with a wide variety of flavours, La Heladeria is situated on the beach promenade of El Duque beach. The Sports Bar is the perfect place to enjoy all televised sporting events. Opening times are dependant on sporting events. The Garden Cafe is situated within the resort Spa offering a range of light and healthy salads and sandwiches. A small selection of shops can be found on the resort selling basic goods and catering for day-to-day needs. These include a gift shop, a mini-market and pharmacy. A larger supermarket is available off-site, just a short distance from the resort. If you’re a beach lover, you can enjoy 800 metres of golden sands with direct access from the hotel within Bahia del Duque resort. Here you can relax and enjoy the all-year-round sunshine, and there is also a choice of watersports available. Free WIFI is available throughout the resort and in the villas. WIFI access is free of charge. On your day of departure there is a luggage room available. The luggage room is available free of charge.